Some time ago, I was kindly invited by Abarta Heritage to write a little something on the ‘Historical Patrick”. I jumped at the chance. Abarta is the leading Irish company specializing in Irish digital audio guides, heritage interpretation and visitor service solutions to communities, cultural sites and institutions. It also happens to be owned and run by archaeologists. There’s something special about heritage material produced by people who have researched, excavated, visited, surveyed and physically held such subject matter in their own hands. It’s comes across in their approach and work. Detail and perspective. I’d like to think it might occasionally come across in mine. The medium of audio is something which I have been interested in exploring for a while. I’m a podcast and radio fiend who inhales historical media. Abarta gave me the absolute freedom to do what I wanted. 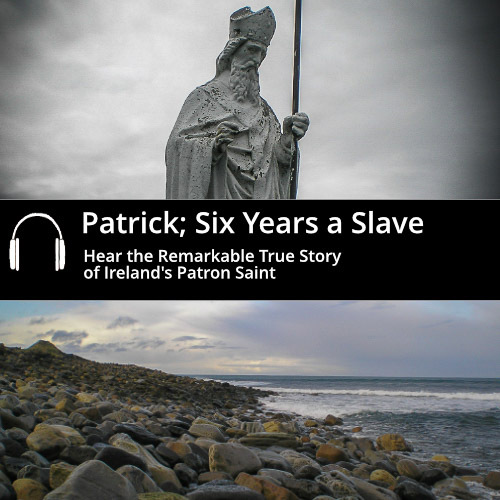 The brief was to come up with something engaging for people interested in learning more about the Historical Patrick – something which would explore the real life person underpinning his later saintly namesake. We wanted to give an idea of his overall background within Ireland and Britain of the time, the landscape he would have witnessed and to give a flavour of what is known about the physical, social and cultural realities. We wanted to let his own story, his own words from his own hands, take centre stage whilst also retaining a wider academic framework informing the narrative. We wanted something which would reflect the rich details, issues and complexities involved in studying Patrick and his works alongside his importance and place in the development of later Irish identity and tradition. The resulting audiobook, ‘Patrick; Six Years A Slave’, is available here. Vox Hiberionacum is licensed under a Creative Commons Attribution-NonCommercial-NoDerivatives 4.0 International License.